What would Thanksgiving dinner be without the stuffing?!? That heavenly, carb-laden dish is the one I look forward to the most each year, but not surprisingly, it’s also one of the most fattening. After some putting some time in the kitchen this past weekend, I was able to create a MUCH healthier version that has about 1/3 of the fat and calories most traditional Thanksgiving Recipes have. I simply took my mom’s recipe (which is THE BEST stuffing in the world, by the way), and altered it. It was easier than I thought, and the end result was pretty darn good! It does require you to make your own bread cubes vs. using prepared ones out of a box, but considering the Points is saves you, it’s so worth it. With stuffing this yummy and healthy, there’s no need to wait until Thanksgiving! 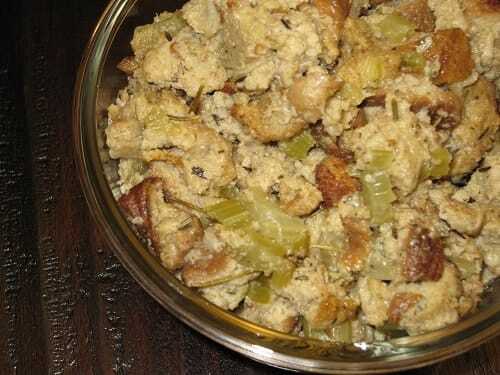 Make your own delicious, homemade Thanksgiving Stuffing with this easy, low calorie recipe. With all the traditional flavors you’d expect, but a lot fewer Points. It’s the perfect healthy Thanksgiving side dish recipe! In a large saucepan, heat water, butter and bouillon to a boil. Add in celery, onion, sage, thyme, rosemary, and pepper, and turn heat down to medium. Simmer until celery and onion are soft, about 15-20 min. In the meantime, put bread cubes into a large oven safe bowl or casserole dish. Pour broth over bread cubes and combine gently until all bread cubes are saturated. Gently mix in the egg. Place stuffing into the oven and bake for about 20 minutes, or until stuffing reaches desired texture. The taste was spot on but the bread to liquid ratio is off. I’d use half the liquid it calls for and maybe even less. Other than that it was very tasty just very soggy. Made this on Thanksgiving. Everyone enjoyed it and I was the only one who knew it was guilt-free! It was fewer points still since a cup and a half serving was too much for me. Thanks for such great recipes! I still lost one pound the week of Thanksgiving, and your site had a lot to do with that! Tasted good but toooooo wet. Even tried putting the pan back in the oven for another 2 hours (at low heat). Still too wet. My last effort will be ‘frying’ it (with PAM, of course) in a pan to see if I can dry it out. I’ll make again, but will use 1/2 the liquid called for. I made this and it was so wet….are you certain it’s 4 cups of water? I had to drain some out and add more bread and it’s still soggy. Let me know if I did something wrong. Otherwise….it tastes fantastic….just soggy! This looks great. Was wondering how to lighten up some of the favorites this year. Thanks for posting!